Hello beautiful vocal athletes, how are you?Ok I needed one more fix.....so here it is. What's your favourite song from the album. Can't wait for the 7th!GO TO Patreon! 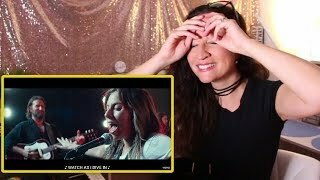 (The green tea lounge) for VOCAL EVALUATIONS/ANALYSIS/MERCH/FREEBIES AND MORE SHIZZLE;https://www.patreon.com/RebeccaVocalAthleteWebsite http://rebeccavocalathlete.com for SKYPE coaching lessons!Email: [email protected]#Neverstopsinging #RVA #shallow #ladygagabradleycooperOriginal video; https://www.youtube.com/watch?v=bo_efYhYU2A*ABOUT:*Rebecca is a passionate Singer-Songwriter/Vocal coach/mentor /impressionist/photographer/creative junkie /self- development lover not a hater. “I want to motivate and inspire others to follow their dreams…corny? Well, maybe but it’s true. So what’s motivating me?? I had a huge tumour removed summer 2016. However, despite not being able to walk for a few weeks, and feeling generally awful…. It has made me create and do what I love! It wasn’t an easy time but I won’t let fear dictate my life. I didn’t think ‘why me’, there are plenty of horrific issues people have to deal with…it’s not always smooth sailing. It’s true when you hear, ‘Life is short’, the crazy thing is, I am glad it happened…I appreciate life even more and try to practice gratitude everyday…It’s so easy to get caught up with the little things…and I do sometimes, but look at the bigger picture, will it matter in a year or two…we are all specks of dust…Also, thank you for all your support. It means a lot. I have suffered from anxiety from the past and self-confidence, (yeah hard to see now right) didn’t think I was ‘good, or worthy enough’ but I feel I have a new lease of life, don’t really care as much and want to show you guys what I have! : ) You are all awesome and without you, there would be no channel.